SpaceX’s Falcon 9 rocket is counting down to a pre-dawn launch from Florida’s Kennedy Space Center on Tuesday, tasked with lifting into orbit a heavy direct-to-home broadcasting satellite for one of the world’s leading telecommunications providers. The 70-meter tall rocket is targeting liftoff at 5:34 UTC, the opening of a two-and-a-half-hour window, and will be in action for 34 minutes to dispatch the EchoStar-23 satellite to Geostationary Transfer Orbit. Falcon 9 conducted its standard pre-launch Static Fire Test on Thursday and returned to its Horizontal Integration Facility on Friday to undergo integration with its payload. EchoStar-23 was transported to the facility Thursday night after completing fueling and encapsulation off base. The assembled rocket, riding on a heavy-duty transporter-erector system, completed the 400-meter trip from the HIF to the pad Monday morning before being placed in its vertical launch position in readiness for a series of fit checks before entering countdown operations in the late afternoon. 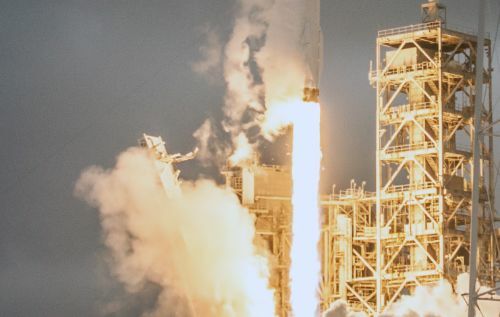 A legless Falcon 9 rocket has become a rare sight leaving a launch pad after SpaceX made great strides in the early stages of its re-use program, successfully recovering eight first stage boosters via propulsive landings on land and at sea. 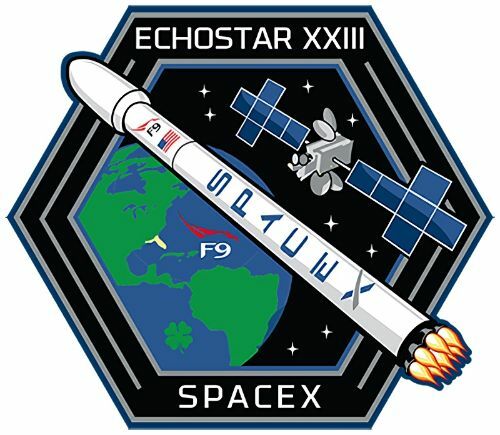 The EchoStar 23 mission will be one of the last expendable rockets to be launched by SpaceX , requiring Falcon 9 to devote its entire performance to the delivery of the heavy satellite into its target orbit, leaving no propellant reserve for the powered return to the Autonomous Spaceport Drone Ship. In the future, SpaceX will employ its upcoming Falcon 9 Block 5 rocket for missions of this type, representing the final performance enhancement expected for the Falcon 9 design focused on another slight performance increase plus implementing modifications that permit a simple turnaround for many re-use missions of each booster. Other missions with even higher performance requirements will be flown by the tri-core Falcon Heavy rocket after it premieres later this year. Although no attempt will be made to salvage the first stage after Tuesday’s launch, SpaceX will likely gather data from the descending first stage for as long as possible to study how the booster performs in a very high-energy entry environment. 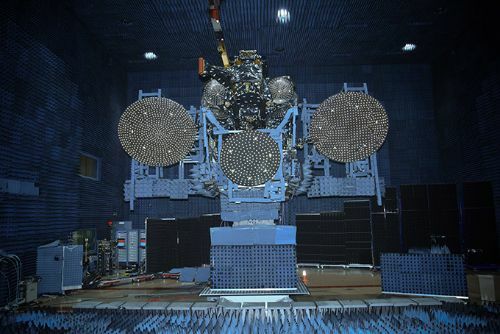 The heavyweight EchoStar 23 satellite has a launch mass of around five and a half metric tons and is destined for an initial position of 45 degrees West in Geostationary Orbit from where it will beam TV programming and data services to Brazil, operating under a government license. Built by Space Systems/Loral, the satellite has been designed to support a multi-mission capability from eight different orbital locations – giving operator EchoStar a powerful tool to quickly respond to changing market demands by relocating the satellite’s capacity. 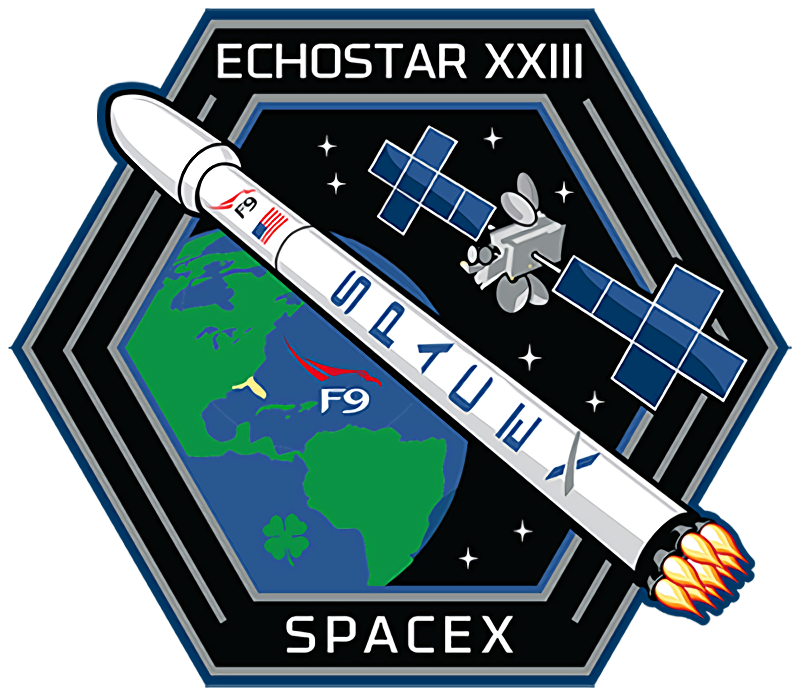 EchoStar was hoping to have the satellite in orbit by the end of 2016, but the September 1st explosion of a Falcon 9 and subsequent stand-down of launch operations further pushed an already busy manifest of missions lined up by SpaceX. 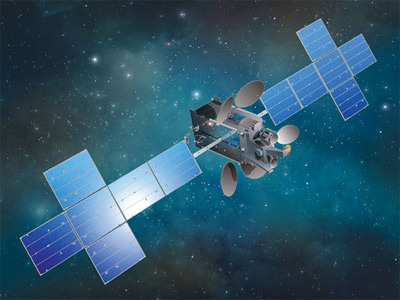 EchoStar said the company will meet the end-of-June deadline for Ku-Band TV services offered by the satellite and will seek an extension for the S/Ka-Band deadlines in case these frequency bands can not be commissioned in time. Tuesday’s mission is the third Falcon 9 launch since SpaceX returned to flight on January 14 with the first flight for constellation operator Iridium from SpaceX’s West Coast facility in California. 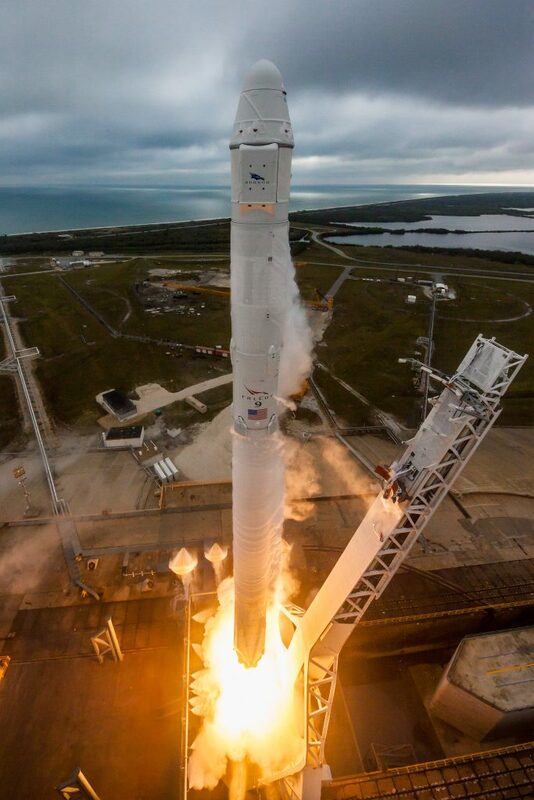 Launches from the Cape resumed on February 19 when Falcon 9 made its first liftoff from Launch Complex 39A at the Kennedy Space Center that once supported NASA’s mighty Saturn V rocket and saw off the majority of Space Shuttle missions during the vehicle’s three-decade career ending in 2011. 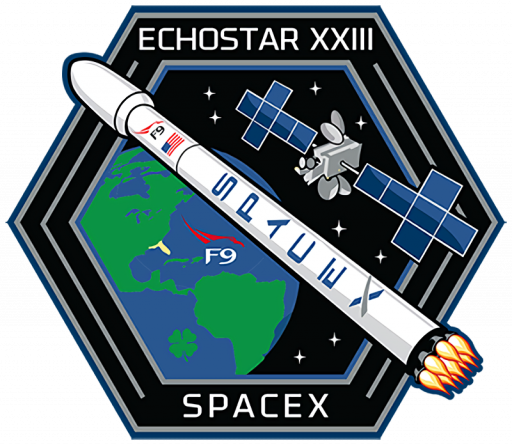 The EchoStar-23 mission marks the opening salvo in a very busy period for launch operations from Florida’s Space Coast. Falcon 9 is on the range for March 14 and a backup on the 16th followed by a Delta IV currently looking at a launch target No Earlier Than (NET) Friday to lift into orbit the ninth satellite in the U.S. Military’s Wideband Global Satcom communications system. Next up will be an Atlas V rocket that stands assembled for launch NET March 21 with the SS John Glenn, the next ISS resupply mission carried out by Orbital ATK’s Cygnus. 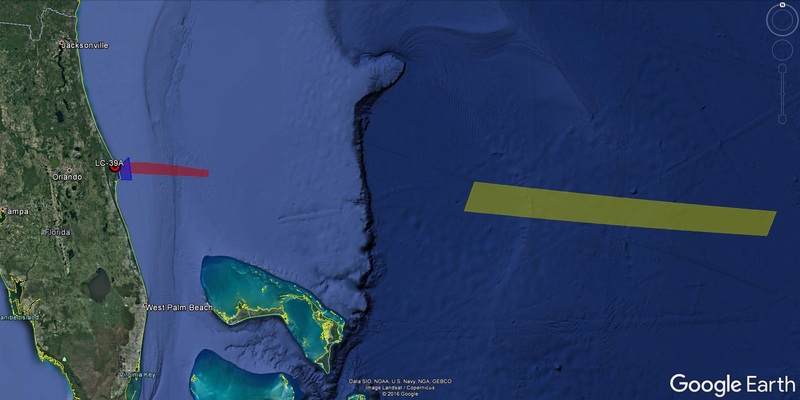 After that it will be SpaceX’s turn again, currently holding a NET March 27 target for the SES-10 mission that will become the first re-flight of a Falcon 9 first stage. Weather could be a factor for Tuesday morning’s mission with meteorologists issuing a 60% chance of weather prohibiting liftoff during the 2.5-hour window. A low pressure system moving in from the Gulf of Mexico is bringing overcast skies, showers and isolated thunderstorms to the Cape on Monday and will linger until late Monday night when clouds are expected to start diminishing. However, a lingering cloud threat will persist throughout the early morning launch window and upper level winds will also be sporty at 140 knots. The best odds for launching will be late in the window which would be facilitated by holding off on loading the rocket with propellants to set up a T-0 late in the day’s window. High-pressure will set in later on Tuesday, creating much more favorable conditions for Thursday’s backup opportunity with a 90% chance of cooperative weather, ground winds being the primary concern. 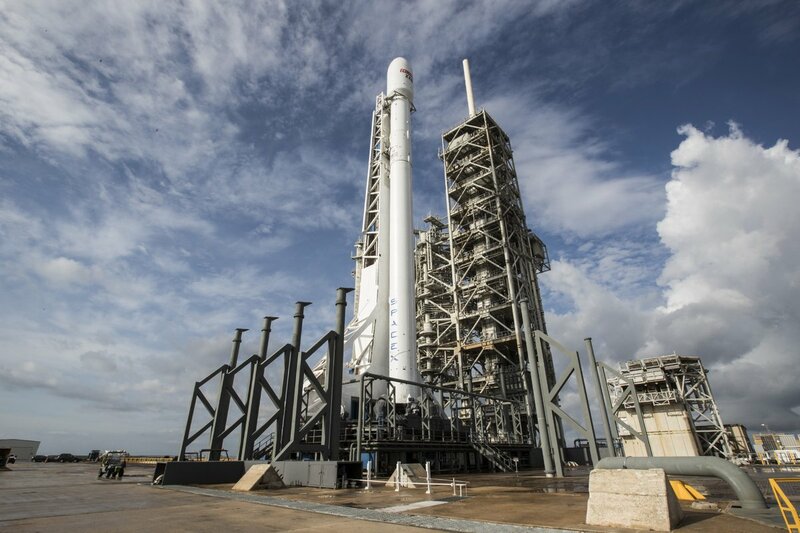 Falcon 9 countdown operations will pick up on Monday with the activation of the Falcon 9 rocket and its various subsystems for a multi-hour checkout campaign as teams seek to award the rocket a clean bill of health before pressing into the fast-paced tanking sequence. Launch Controllers will be polled at 4:16 UTC for a Go/No Go to head into the automatic propellant loading sequence set to pick up right at the T-70-minute mark. Tuesday’s launch again uses the more relaxed tanking timeline implemented as the result of the investigation into the September 1st mishap that uncovered that the rapid loading of pressurization gas and propellants into the second stage contributed to creating a highly volatile environment which ultimately led to the rapid combustion of liquid or solid oxygen with the carbon overwrap material of a pressurant tank submerged in the supercold oxidizer. As the countdown’s automatic sequence kicks in, Falcon 9 will begin receiving chilled Rocket Propellant 1 while also chilling down its oxidizer tanks before the sub-cooled Liquid Oxygen begins flowing at T-45 minutes. All in all, Falcon 9 will receive over 500 metric tons of propellants with fueling closing out in the last five minutes of the countdown to ensure the densified propellants remain as cold as possible. EchoStar will transition to battery power in the last half hour of the count and Falcon 9 will head into a highly choreographed sequence of events at T-7 minutes, picking up with the chilldown of its nine Merlin 1D first stage engines. The rocket will transition to battery power and enter preliminary tank pressurization to stabilize the stack as the cradles of the Strongback are opened and the structure enters its pre-retract position to be primed for a rapid kickback at the moment of liftoff. A final GO will be voiced from the Eastern Range and the Launch Director inside T-2 minutes prior to handoff to Falcon’s computers at T-1 minute. Falcon 9 will soar to life at T-3 seconds, reaching a liftoff thrust of 694 metric-ton-force as the nine Merlin engines throttle up under the close watch of computers. 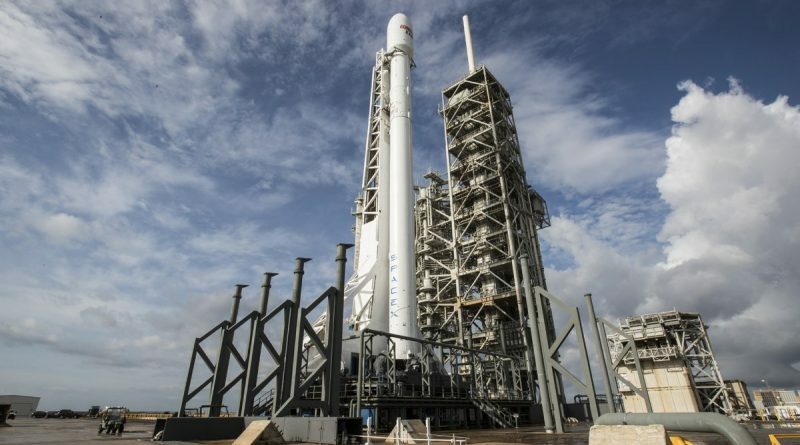 Rising from its launch mount, Falcon 9 will balance vertically as it clears the 106-meter tall tower left behind from the Space Shuttle Program and set to support future crewed launches of the Falcon 9 and Falcon Heavy rockets. 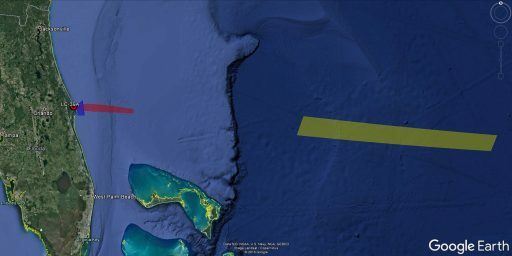 Thundering into the night, Falcon 9 will pitch and roll onto a trajectory taking it east-south-east across the Atlantic Ocean, the standard route into a Geostationary Transfer Orbit from Cape Canaveral. The rocket will pass the speed of sound just over one minute into the mission and encounter Maximum Dynamic Pressure at T+1 minute and 16 seconds, briefly throttling back the first stage to limit stress on the vehicle. The first stage will fire until T+2 minutes and 43 seconds, roughly twenty seconds longer than in a recovery mission, delivering the extra bit of performance needed for EchoStar to reach its orbital destination. The two stages will part ways four seconds after MECO when pneumatic pushers will send the first stage clear of the second stage’s MVac engine for ignition at T+2:55. At that point, the active role of the first stage is finished. The Autonomous Spaceport Drone Ship is sitting this mission out and the stage is expected to find a watery grave after continuing on a ballistic arc after stage separation. It remains to be seen whether SpaceX is planning any post-separation maneuvers to put the stage into an engines-first position for re-entry to see how the booster behaves in a particularly challenging environment without braking maneuvers before hitting the atmosphere. For the second stage, the first task will be a burn of five minutes and 36 seconds to push the stack into a Low Earth Parking Orbit with a peak thrust of 95,000 Kilogram-force. 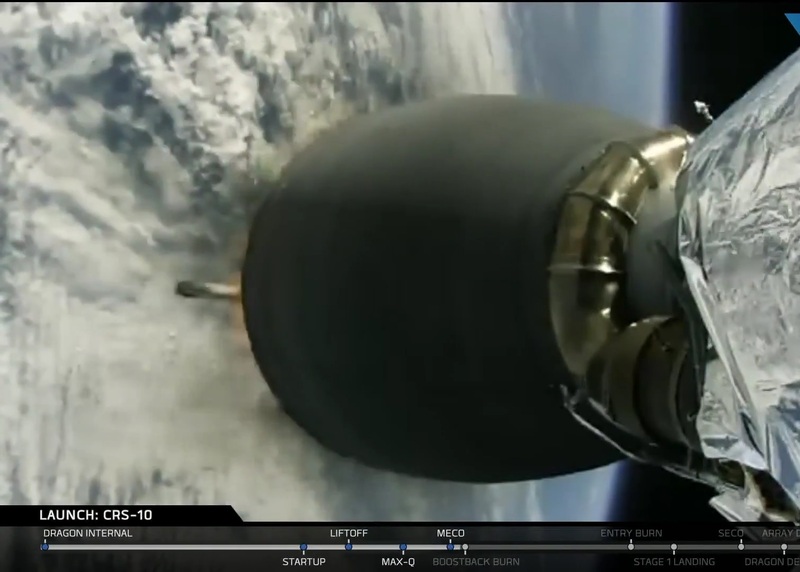 Three minutes and 43 seconds into the mission, Falcon 9 will jettison its 13-meter long payload fairing halves to shed no-longer-needed weight as aerodynamic forces will no longer present a threat to the satellite after Falcon 9 departed the discernible atmosphere. Following engine shutdown eight and a half minutes into the mission, Stage 2 will transition to coast mode for 18 minutes, continuing on a south-easterly path to perform the second engine burn while crossing the equator so that the high point of the final orbit is located over the equator on the opposite side of the planet – standard procedure for GTO missions. MVac is planned to re-ignite 26 minutes and 19 seconds into the flight on a burn of exactly one minute that will involve some heavy throttling on the engine to maintain a maximum acceleration of 5Gs. No target orbit parameters were released by SpaceX or EchoStar. 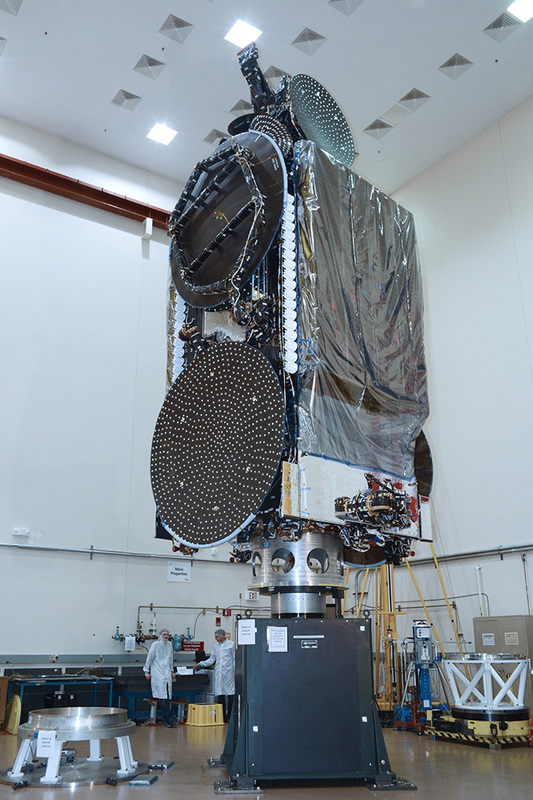 EchoStar 23 will be sent on its way 34 minutes after liftoff, beginning several days of maneuvering to transition from its elliptical injection orbit to a circular orbit 36,000 Kilometers above the equator where the satellite’s speed matches the rotation of the Earth, allowing it to remain in a stationary position in the sky. Initial checkouts are planned from a location of 86.4°W before the satellite will move to its operational location for coverage of Brazil.